Worldwide, 1 in 2,500 people are affected by these inherited neuromuscular diseases. Before molecular biology and genetic testing, CMT disorders were broadly classified into Type 1 (with abnormally low nerve conduction velocities, suggesting demyelination) and Type 2 (with normal nerve conduction velocities, suggesting axonal or neuronal degeneration). Found in both genders and in all races and ethnic groups, it is the most commonly inherited peripheral neuropathy, affecting 2.8 million people worldwide. This rare, inherited, slowly progressive neuropathies that came to be known as Charcot-Marie-Tooth (CMT) disorders were described independently in 1886 by Charcot and Marie in France and by Tooth in the UK. Onset can occur at any age but is most frequent in the first and second decades of life [1,2]. 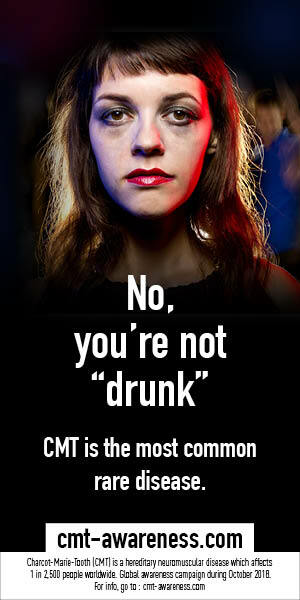 WHAT ARE THE FIRST SIGNS OF CMT? 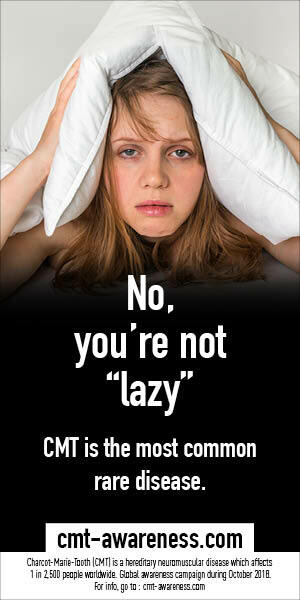 First symptoms of CMT include frequent steppage gait, clumsiness and “burning” sensations in the feet or hands. Musculoskeletal pain, ankle sprains/fractures, and poor quality of life are common. 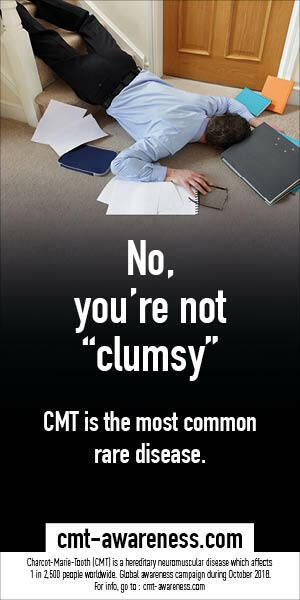 The main symptoms of CMT1A are weakness of the feet and ankles, symmetric muscle atrophy below the knees, gait impairment, and distal sensory loss. Abnormal sensation in the extremities and an inability to sense where one’s body is in space are also common. Poor tolerance for cool or cold temperatures is typical and many people have chronically cold hands and feet. Additional symptoms may include fatigue, sleep apnea, breathing difficulties, scoliosis, kyphosis and hearing loss. Is there a treatment for CMT ? There are currently no curative or disease-modifying treatments for CMT1A. Patient management is conservative, with physiotherapy, occupational therapy, technical aids, orthoses, pain treatments and rarely orthopedic surgery . CMT1A is currently the only CMT subtype for which a drug candidate is under Phase III clinical development – meaning that it may soon be even more important to identify patients with this disease [5,6]. During our 2018 campaign we are glad to announce you that Pharnext, a biopharmaceutical company pioneering a new approach to the development of innovative drug combinations based on big data genomics and artificial intelligence, announced on October 16 2018 positive results from pivotal Phase 3 trial of PXT3003. Until now, there has been no prospect of effective pharmacological treatment. The members of the European CMT Federation look forward to having a complete information and learning more about the following steps of this treatment. Who can help you find out more ? 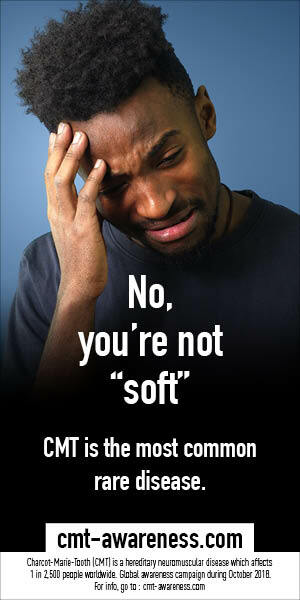 Some of general practitioners, neurologists and podiatrist may be aware of the CMT existence, specific signs and medical care. Unfortunately, diagnostic errors are still very often nowadays. An international observational study to collect Real-World Evidence (RWE) data from people living with CMT will be launched progressively in Europe by the end of 2018. The objective of the study is to better understand the impact of the disease on patients’ daily life: the burden of CMT, its natural history and treatment, and medical, social and pharmacoeconomic effects. Participants will be able to download and use the CMT&Me App on their smartphones or tablets (Android or iOS) in the comfort of their own home or on the go, and data will be collected in real-time. They will be able to fill out background and quality of life questionnaires, record their symptoms in a diary and access the knowledge section which contains medical and practical information about the condition. 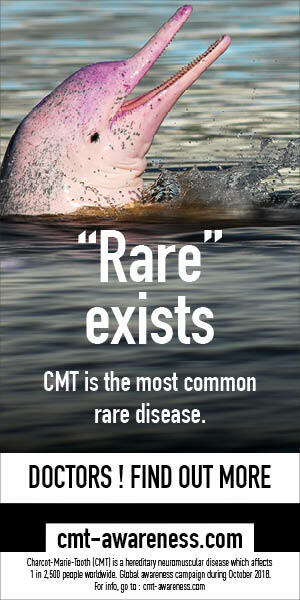 For regular update on the study and the CMT&Me app, please visit ecmtf.org. SILENCE IS NO LONGER POSSIBLE!